Your cascade high mountain adventure starts here! The Village Inn manages vacation rentals 24/7. Condominiums are open year-round on US Highway 12 milepost 151.1, elevation 4,500 ft. Our address is 48933 US Highway 12, WA at the summit of White Pass, across the street from the ski hill. 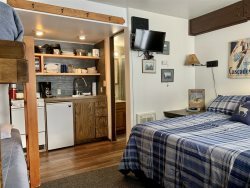 White Pass Village Inn Rentals provides year-round mountain lodging in the heart of the Washington Cascades to ensure that you experience quality customer service, clean surroundings, and easy access to your favorite outdoor activities. White Pass Village Inn Association provides property management services to our owners who love to play in a recreational paradise. Whether you are an owner or a guest, a returning customer or a first time visitor we respond quickly and professionally. We accept online inquiries from vacationing families and individuals, passersby, and other guests looking for lodging along the White Pass Scenic Byway. We provide on-call, on-site rental services 24 hours a day, although office hours vary by season. The Village Inn is embracing a new adventure story as we work as a team to update our operations to match 21st century lifestyles while maintaining our relaxed mountain history. Our goal is to leave every owner, guest and employee with a positive feeling of being treated consistently, fairly and courteously.